As most Droid 1 owners know at this point, the Android 2.2 OTA update resumed its rollout last night and almost instantly we had readers receiving it. However, we wanted to make sure that the rest of you who have yet to receive notification, know that you could be waiting until the 18th! Well, up until the 18th. The chances if it hitting your phone on that last day are pretty slim, so if you don’t feel like waiting then feel free to manually update now. 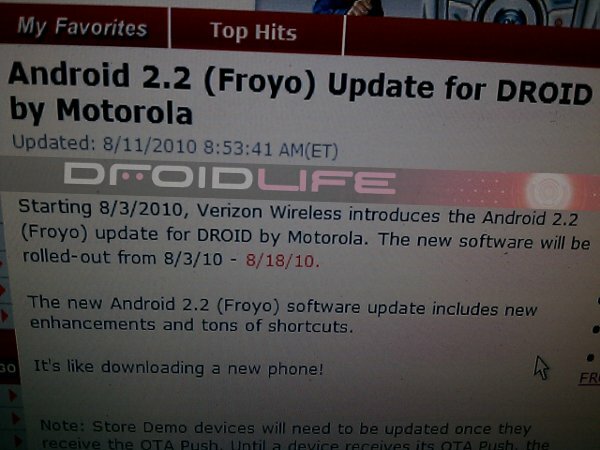 DROID X Sees Custom Recovery Image, ROMs Next?